A finite mixture model is a stochastic model that postulates that the probability distribution of the data generation process is a mixture of a finite number of probability distributions. For example, when an insurance company analyzes loss data from multiple policies that are underwritten in different geographic regions, some regions might behave similarly, but the distribution that governs some regions might be different from the distribution that governs other regions. Further, it might not be known which regions behave similarly. Also, the larger amounts of losses might follow a different stochastic process from the stochastic process that governs the smaller amounts of losses. 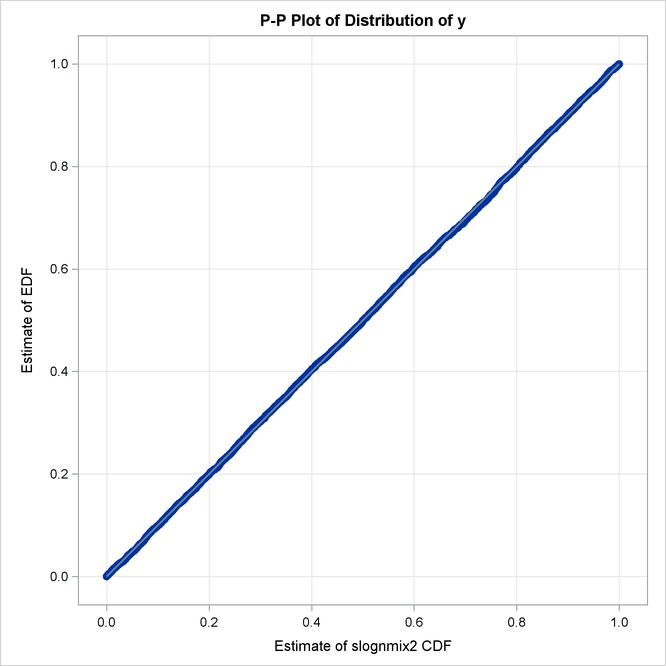 It helps to model all policies together in order to pool the data together and exploit any commonalities among the regions, and the use of a finite mixture model can help capture the differences in distributions across regions and ranges of loss amounts. where denotes the parameters of component distribution i and denotes the parameters of the mixture distribution, which is a union of all the parameters. denotes the set of mixing probabilities. All mixing probabilities must add up to 1 ( ). 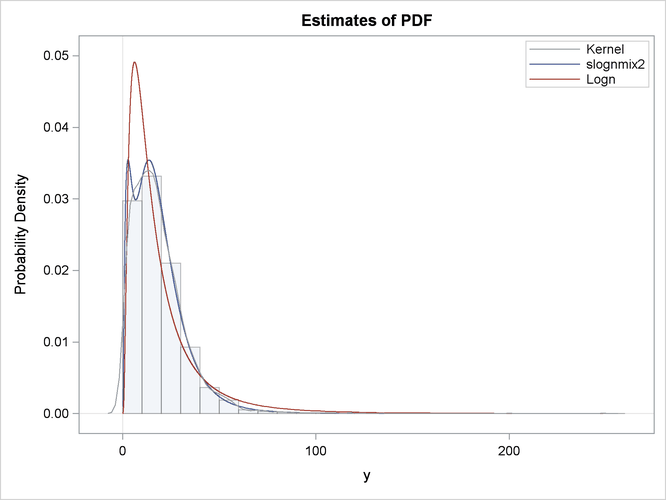 You can define the finite mixture of a specific number of components and specific distributions for each of the components by defining the FCMP functions for the PDF and CDF. However, in general, it is not possible to fit a scale regression model by using any finite mixture distribution unless you take special care to ensure that the mixture distribution has a scale parameter. This example provides a formulation of a two-component finite mixture model that has a scale parameter. where , , and denote the modified sets of nonscale parameters. One simple way to achieve this is to make and ; that is, you simply equate the scale parameters of both components and keep the set of nonscale parameters unchanged. However, forcing the scale parameters to be equal in both components is restrictive, because the mixture cannot model potential differences in the scales of the two components. A better approach is to tie the scale parameters of the two components by a ratio such that and . If the ratio parameter is estimated along with the other parameters, then the mixture distribution becomes flexible enough to model the variations across the scale parameters of individual components. than log(sample mean), then revert to Rho2=0.5. That will set Sigma1 and possibly Sigma2 to missing. Solution of this equation yields the value of in terms of and the sample median. Note that has a valid value only if . Among the many possible methods of ensuring this condition, the SLOGNMIX2_PARMINIT subroutine uses the method of doing a linear search over . The comparison of the fit statistics of SLOGNMIX2 and LOGN, as shown in Output 23.7.1, confirms that the two-component mixture is certainly a better fit to these data than the single lognormal distribution. The comparative plot of probability densities in Output 23.7.2 shows that the density function of the mixture distribution is bimodal. In fact, one of the key motivations for using mixture distributions is to find better-fitting models for multimodal data. 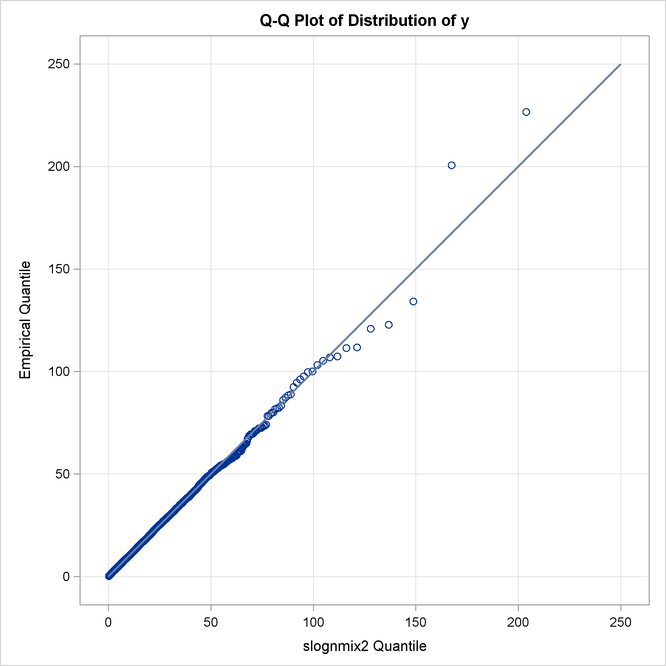 The P-P and Q-Q plots in Output 23.7.3 visually confirm that SLOGNMIX2 fits the data very well. The detailed results for the SLOGNMIX2 distribution are shown in Output 23.7.4. According to the "Initial Parameter Values and Bounds" table, the initial value of is not 0.5, indicating that a linear search was conducted to ensure . By using the relationship that , you can see that the final parameter estimates are indeed close to the true parameter values that were used to simulate the input sample.